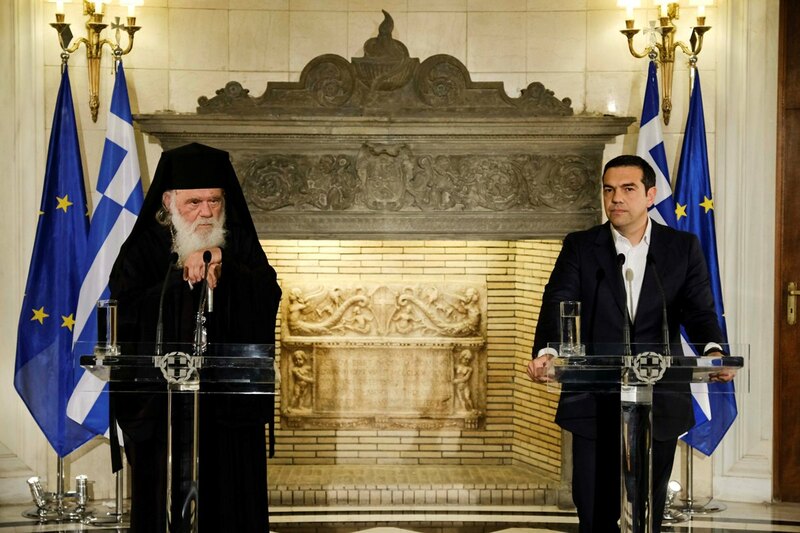 In joint statements made on Tuesday evening, Prime Minister Alexis Tsipras and Archbishop of Greece Ieronymos announced a “historic agreement” between the government and the Church of Greece to reform their ties. The surprise agreement, which follows the recent launch of a process to review the Greek Constitution, was announced after a meeting the two men held at the Prime Minister’s office. One of the main elements of the agreement is a deal that will see clerics no longer considered civil servants. Instead of making direct salary payments to them, the State will pay a fixed amount to the Church of Greece. Additionally, agreement was reached on the treatment of the Church’s estate and its management. A fund that will be jointly managed by State and Church officials will be founded to manage Church assets. The Prime Minister said the agreement – which is subject to approval by Greek parliament and the Holy Synod – will “strengthen the autonomy of the Church, recognizing its role”. The premier also dismissed rumors that Christian symbols will be “torn down”, vowing instead to respect the “age-old traditions of our people”. “What we and this agreement are showing is our intention to move a step forward, with mutual respect for one another,” the Archbishop said. “We thank you because you were a factor of change at this historic moment, in this great event for which the Church feels not that it is becoming wealthier […] but that it becomes more functional in fulfilling its visions,” Ieronymos added. He went on to thank Tsipras for “leaving the preamble of the Greek Constitution as our fathers wrote it,” referring to the role of the Church in Greece. At the end of the meeting between Tsipras and Ieronymos, the main opposition New Democracy party welcomed what it said was a delayed adoption by ruling SYRIZA of its own stance on Church-State relations.